it's my month in the bee I belong to and we've been doing granny square blocks using a whole variety of my scraps along with a natural shade solid - the blocks are starting to come in already and I don't want to leave them languishing! purchase backing and batting for my disappearing 9-patch Brrr! quilt. I'd hoped to get this one finished by Christmas and it just didn't happen. But I figure that since the fabric is more of a winter fabric than a Christmas fabric, I'm still good to go for a few more months! figure out what to do with my Etsy shop. I haven't had any sales since around the time of Black Friday, and neither of the two Christmas-y items I had listed sold. I honestly don't know how much effort I want to put into stocking the shop and promotion and all that stuff so my thought at the moment is to just put stuff in there when I have something to list, and if it sells great, if not, no big deal. Which is kind of how I started off thinking about it anyways. We just got back today from our week away visiting family, I'm marking my google reader as "read" and will carry on from here. 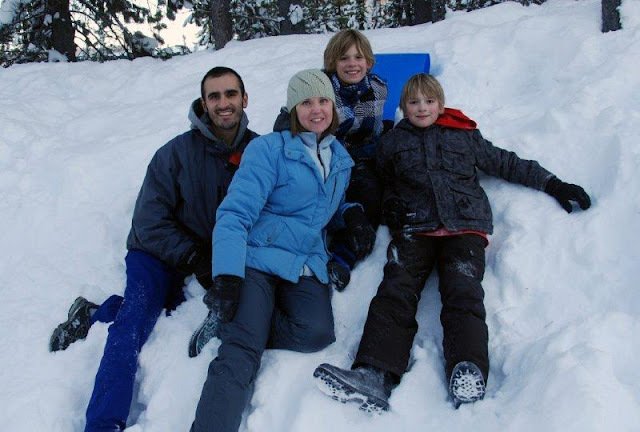 The family picture was taken by my Dad on Wednesday, our "snow day". We had to drive 1.5hrs to find that snow, and it was coooooold, but it was worth it. We had a ton of fun! Yeah, time away and the holidays really throws things off doesn't it? Good luck easing back into the sewing...LOVE seeing the family pic - really sweet! So glad you're back! I think that's exactly the right attitude for etsy (at least it's mine, lol). Happy new year! Glad to see I'm not the only one out of touch with everything right now. You have a great looking family, Heather! Good luck on conquering that list! Hey, you had a good holiday (I assume) and that's what matters! Good luck easing back into the sewing and life and all that! I love your snowy picture! Welcome back to sewing . . . sometime it's nice to have a break -- I know I'm more motivated after having some time away! Happy New Year Heather! Looking forward to seeing all your great work this year. Love the snow pic-made me chuckle that you had to trek 1.5 hrs to get to it! Hope you didn't feel any of the effects of the quake yesterday! Happy New Year! So nice to see a picture of your smiling family! Welcome back! I'm just now getting caught up too. It's nice to take a break for the holidays and just enjoy the craziness. Love the family picture, welcome back! Looks like you had a fun day! Happy New Year! I'm feeling the same way--it's hard to get back into a routine. don't give up on etsy - just fill it when you have items and wait it out. I've found it comes in waves. I get a couple of sales one month, then nothing for a few months, then another big month. Some items have been in there since I started, but if they are just sitting on a rack somewhere collecting dust, might as well have them for sale!